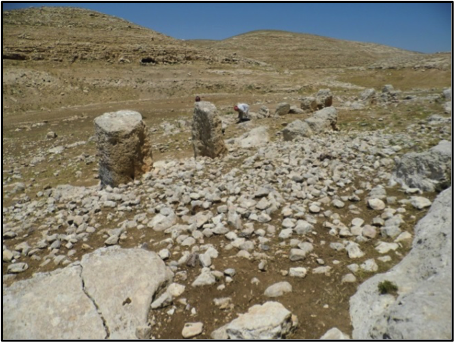 The Ritual Landscape of Murayghat project includes a survey and excavation in central Jordan. The site of Murayghat has been mentioned by many early travellers and other passers-by, who describe the site and its surrounding in some detail, estimating that 150 dolmens would have existed up to the early 20th century. It is situated southwest of Madaba close to the confluence of Wadi Main and Wadi Murayghat, above the rather steep sides of Wadi Main. The site consists of a central knoll, covered by many ancient walls built from single lines of standing stones, surrounded by low hills to the north, west and southwest, while southeast of the road a low field soon drops down to the steep sides of the Wadi Main. The hills are covered by dolmens of different size and many other stone structures, reaching from large single standing stones to stone circles and several tombs (mostly in caves). The north-eastern and south-western hills are much affected by stone quarries. The importance of the site lies in the combination of large dolmen fields with a central site in the middle, a combination that does not exist elsewhere in Jordan. Nearly all dolmens are visible from the central knoll (there are no dolmen on the other side of the surrounding hills). Such a central site with many structures of standing stones has not been studied so far. The new project by the University of Copenhagen (Institute for Regional and Cross-Cultural Studies) directed by Susanne Kerner started in 2014 (with financial help from the Danish Institute in Damascus, the H. P. Hjerl-Hansen Mindefondet for Dansk Palæstinaforskning, and University of Copenhagen) with a survey and the excavation of three small trenches on the central knoll as well as a survey of the surrounding hills. The central site shows one possible circle on the highest point on the bedrock, several horse-shoe or circular shaped structures and a large wall running at the outer circumference of the site. Numerous cup-holes have also been docu­men­ted with a concentration of them along the wadi’s edge, where in some cases groups of four and six have been found. Several areas of the central knoll have a cobbled surface of densely packed fist-size stones. The trenches showed a succession of wall-like structures, which consisted of fist-sized stones, but in case of the largest walls also of much larger lime­stones, set in a double line filled with smaller stones. Many of these walls can be followed on the surface for several meters and will require further study. The systematic survey of the surrounding areas brought standing stones, at least 20 caves of which many have been used as tombs, unclear stone structures, often broken down dolmens (at least 23), but several also still standing, as well as numerous cup holes. The pottery (very small and fragmented) included Islamic and Roman fragments, but consisted mostly of Late Chalcolithic, Early Bronze and Middle Bronze age material. One basalt vessel has been found, most other basalt fragments seem to be waste material. Other finds include hammerstones, and one metal item, as well as large amounts of knapped material.